1. In a small bowl, toss the red onion and the vinegar to thoroughly combine. Let sit until the onions soften, 1 to 2 hours. Store in an airtight container in the refrigerator for up to 2 weeks. 2. Preheat the oven to 425°F (220°C). 3. On a rimmed baking sheet, combine the cauliflower and pineapple and toss with the olive oil, taco seasoning, and salt. Arrange in an even layer and roast until the cauliflower is fork-tender and nicely charred, about 25 minutes. Taste and adjust the seasoning. 5. Heat the tortillas in a pan over medium-high heat or by placing each directly on the burner over medium-low heat until lightly browned, 20 to 30 seconds per side. 6. Layer on some of the cauliflower and pineapple, cashew queso, pickled onions, and avocado. Garnish with cilantro and serve with lime wedges. These vegan cauliflower tacos al pastor were absolutely delicious! I really thought my husband wouldn't be a fan of the queso but he loved it and was literally licking the spoon! The flavors and textures were really well balanced—sweet pineapple, spicy cauliflower, creamy queso and avocado, and crisp pickled onions. It was a delight to the taste buds! I will admit that, being a meat lover, I made a pork chop on the side just in case these weren't filling enough but the consensus was that they were perfect as is, without the meat. That means a lot coming from a total carnivore! I followed the recipe exactly except I don't know what taco seasoning is so I used chili powder instead and it was delicious. I would recommend doubling the cauliflower and pineapple mixture. The roasted and spiced cauliflower and pineapple, served with pickled onions and avocado and real cheese queso, worked out really well. This was a hit with just the one change. The pickled onions had too much vinegar—I would reduce the amount and just toss the onions over time. The only thing that we didn’t care for was the queso. Wow, these vegan cauliflower tacos al pastor are good, really really good! Don't compare these to any other tacos you've had before. Just go for it. These spicy-sweet veggie tacos are easy as 1-2-3. One for taco seasoning, which I didn't have, so used a chili powder blend. Two is the number of cups of chunked pineapple straight outta the can (again, I'm skeptical). Three cups of cauliflower, in bite-size nibbles. Roasted till toasty brown, even a bit blackened, in the time it takes to blend up some savory cashew queso (what?!) and assemble toppings. Wrapped up with pickled red onions, cilantro and lime, these tacos were a real treat—and something I'll make again. Next week. About that queso. I soaked my cashews before blending, then drained and rinsed them before dumping them into the blender jar. The queso thickened up nicely on the stove; careful to stir often as the bottom wanted to stick and burn. Plain chile powder worked GREAT and didn't even need more salt. I skipped the avocado and used Cholula hot sauce with my cilantro and lime. Outstanding and easy weeknight tacos al pastor that are satisfying and vegan friendly. Really surprised at how nicely the cauliflower and pineapple worked. Although there are several components, each takes a very short time to prep. The one thing I tried with a second batch was to increase the amount of cauliflower to 4 cups while leaving the pineapple the same, which gave a better balance of sweetness for our taste. I increased the spice to 1 tablespoon and let the olive oil the same. While a powerful blender helps, it might not be absolutely necessary. The cashew queso was the first time I made a cashew cream without presoaking, but that was not a problem at all in my blender. Be careful to gently heat this mixture and pay attention—as it thickens, it can scorch if the heat is too high. Leftover queso held nicely for 2 days (and then it was all gone but probably would have been good for a few more days if it were not so delicious to want to use it up). I liked it best when first putting a smear of the quesa on the tortilla then adding the cauliflower and pineapple mixture. You can top with a dollop more queso or lime sour cream, then a few of the pickled onions, cilantro and avocado. One of the most “more-ish” things we have made in a while, and I think I do not miss meat at all in this. This is not just a good vegan taco - but a terrific taco. Period. 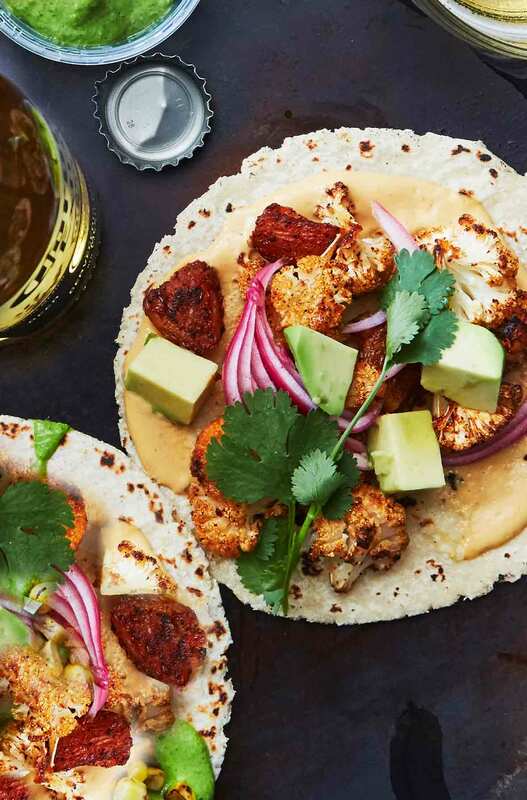 Vegan Cauliflower Tacos Al Pastor Recipe © 2018 Chloe Coscarelli. Photo © 2018 Christina Holmes. All rights reserved. All recipes and photos used with permission of the publisher. Hi Maria, you can find nutritional yeast at health food stores or grocery chains like Whole Foods or Earth Fare. It is used as a cheese substitute in vegan dishes as it provides a a nutty, cheesy creaminess. 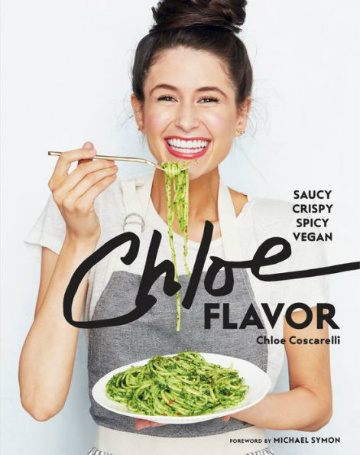 If you are not trying to make a vegan dish, you could use real cheese. Thank you! Very helpful. I was able to locate nutritional yeast at Whole Foods. Since it was a very large container and I’m not vegan I’m going to initially try the recipe this week with a substitute. However, I am intrigued by the nutritional yeast so if I can find additional uses for it I will invest in the ingredient. Thanks again for your speedy reply. Hi Maria, I think you will be surprised when you try it as it really does have a cheesy flavor. Sometimes it is available in bulk so you can buy just a bit to try it.